It’s safe to say that each Summer, Wimbledon is quite an inspiring and enjoyable sartorial event. From Sienna Miller, Victoria Beckham, Stella McCartney and Kim Sears sporting amazing outfits to the players themselves, Wimbledon Centre Court is quite a fashion show! If you have a fair skin like Stella McCartney and are concerned by sitting in the sun all day, aim to wear a light dress with long sleeves to protect your skin from the sun. This belted cotton & linen midi dress by See By Chloé or this panel dress from Mango are beautiful, stylish options. Accessorise it with a nice straw hat, a pair of classic Rayban and these pretty Carter sandals from Hush Homewear and of course, don’t forget to apply sunscreen on your face. Aiming to make the most of the sun to top your tan while watching the game, this lovely Carmen off-the-shoulder top is great worn with a long skirt or white tailored shorts or these in black. Accessorise the look with a pair of pretty Castaner espadrilles to lengthen those pins. It can be difficult to know what to bring to the picnic party when you’re trying to eat healthily. Childhood picnic memories are filled with images of cocktail sausages, party rings, pringles and well certainly no good stuff! However, with a slight switch of mindset and a few small changes surrounding our options, our picnics can be kept as something not only fun but accompanied by delicious food filled with goodness. Now I think about it, oh how my ideals of the most perfect picnic have changed; I used to love the idea of an abundance of said junk food and lazing around a picnic mat talking about things I don’t think I even remember. That being said, I still love chilling out with friends in a picnic situation, I just love a lot more about it too! Getting creative in the kitchen is one of my biggest passions, and so challenging myself to recreate or newly create dishes that I know will go down a treat at occasions like this only excites me – plus, consuming food (and drink) of this nature means you’ll be perfectly fuelled for a game of frisbee or charades without the food coma accompaniment that generally comes with post-picnic indulgence! So, here I have a few of my favourite picnic-style recipes to give you some brilliant inspiration for your most perfect picnic at Wimbledon this summer. When I was a teenager, playing tennis was part of the school curriculum. I was more suited to netball at the time, being the tallest in the class, and always got roped in to be Goal Shooter, but I loved playing tennis, even though we only got to play it in the summer. Dad, ever the optimist, was convinced that one day I would play tennis for England. Alas, life didn’t quite turn out that way but now I have my own children, I can understand Dad’s passion for sport… and have found myself on more than one occasion echoing what he said to my own children. I have been on a weight-loss journey for six months and during that time, I have tried several types of exercise – running, cycling and Zumba to name three. Some more successfully than others. However, I recently noticed that a brand-new tennis centre was being built a five-minute walk away from where I live and although it’s just a shell at the moment, it inspired me to turn my hand to tennis again. For the first time in 30 years, I found myself at a council-run tennis court on Sunday with my 12-year-old son. What I first noticed, apart from it being a huge amount of fun, was that the exercise I’ve been doing over the last two months has strengthened my entire body and I feel fitter now than I have done in at least 10 years. My shoulders and arms feel strong, which is great for both my backhand and forehand, and going to Zumba has increased my flexibility and I found I was able to reach for shots I otherwise wouldn’t have had a chance in getting. My overall stamina from 12km bike rides meant I could easily run after the balls when my son didn’t quite get a shot anywhere near me! But it was all great exercise and we came away saying how much we’d love to play every week. So whether you want to play tennis for England and set your sights on Wimbledon, or just take your children to your local tennis court and have a knock about, think about improving your all-round fitness with something like a dance class – or start cycling everywhere instead of driving – you’d be surprised at what a big impact that has on your body, even later in life. It’s never too late to take up a new sport or improve your fitness and I’m so glad that tennis is part of my life again. #MyWimbledon 10 Essentials to pack for a day at Wimbledon, by Elle Croft. It’s that time of year again – blink and you’ll miss it – when strawberries and cream are back in style and polite clapping is the new raucous cheer. The Wimbledon Championships is a chance for tennis fans across the country take to public squares and beer gardens to cheer on their favourites, and for a lucky few to enter the famous grounds and watch the ball to-ing and fro-ing in the flesh. There’s food available on site, but for the most gourmet experience, pack your own picnic to enjoy on the mound. Recipes like this strawberry, avocado and spinach salad, or these turkey, apple and brie sandwiches are sure to be the envy of your mound-mates. Picnicking without something sweet at the end is like going out for breakfast without ordering coffee. Make something incredibly British like Eton Mess, or get in the Wimbledon spirit by ordering yourself some strawberries and cream. British weather is admittedly unpredictable, but you can still get burnt under cloud cover, and trust me (from experience): the one souvenir you don’t want to bring home from Wimbledon is a sunburn. Umbrellas don’t really work at Wimbledon as you’ll probably poke your neighbour’s eye out. Go for a waterproof instead and enjoy the British summertime drizzle in comfort. If you queue for Grounds tickets you’ll need cash just to get in. Once you’re inside you can pay by cash or card to buy your programme, Pimms, and that all-important strawberries and cream. If you plan to queue (and I highly recommend it for the experience) or watch some of the action from Murray Mound, pop a blanket or towel in your bag to picnic in style. Top tip: look like a total pro with one of these. A day at Wimbledon wouldn’t be complete without a sip of Pimms, but you can bring your own drinks in, too. Whether it’s pink lemonade or pinot grigio, pack it in your bag – but be sure to check the regulations first! For the myriad Instagram opportunities. Leave the selfie stick at home, though – they’re banned. You may think that a day at Wimbledon involves a lot of sitting. You’re right, but Wimbledon is a huge place, and it’s worth going for a stroll to see all of the outer courts and the stunning flower displays dotted around the walkways. Because, in the end, Wimbledon is about so much more than tennis. What would Wimbledon be without strawberries and a glass of fizz? I would love to share with you, the simplest and most delicious champagne cocktail recipe I know with you today. It is perfect to enjoy whilst watching all of the action on court, rain or shine I can guarantee! I punnet of strawberries – approximately 400g, if you can buy or grow wild/Alpine strawberries they taste amazing. Take one whole punnet of strawberries, together with a couple of leaves of mint, and blitz these up until they make a puree. You could add a little sugar syrup, but if the strawberries are ripe, at this time of year they should be sweet enough. Add a few teaspoons of the strawberry and mint mixture into a champagne glass, and top off with ice cold champagne. Simple, but boy this is perfection. This should make enough for one or two bottles of champagne depending on how strong you want the strawberry taste to come though. If you were feeling daring, a slight variation on the recipe would be do add a teaspoon of brandy to each champagne glass too. Our friend Jen from Love Chic Living is here to help us bring tennis inside the home this Wimbledon. I’m often inspired by events around me in the way I decorate my home. Particularly when it’s an event I’m so passionate about, and tennis just happens to be one of them. You might think it’s too hard to create an interior inspired by sport but there are lots of ways you can add touches of tennis to any décor. It doesn’t have to be that obvious if you want to keep it minimal and stylish, and think of associated pieces to keep it fresh. I’ve done some research and found some of my favourite tennis inspired home décor ideas to give you some inspiration this summer. If you happen to have a few old, vintage tennis racquets hanging about, or find some at the local charity shop, they make fabulous décor pieces if you use a little imagination. 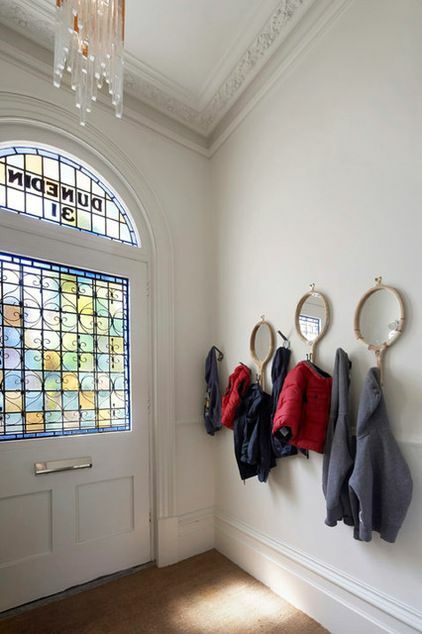 As above, you can turn them into great wall hooks in the entrance hallway, or use them in a wall collage or display, or even add a few little hooks to them to store your jewellery. What would you use yours for? I absolutely adore this tennis wallpaper from Cazalet Designs which features a delicate geometric design, on a fresh green background, with of course, yellow tennis balls. It’s fun without being too quirky and wouldn’t jar with other décor pieces. Coordinated, as in the picture, with bright contemporary décor it looks cool without being kitsch. Ideal as a statement wallpaper or even an all over pattern in a smaller room. Of course, it would be remiss of me to not include the wonderful Christy towel. This has to be the easiest way to incorporate that tennis look into your home. Soft, luxurious towels edged in the Wimbledon colours, stylish and very practical. In fresh white with just a nod to the tennis scene, this is a bang on-trend way to add some tennis inspired interiors to your home. If the vintage or industrial look appeals to you and your home, and you’d like to incorporate some tennis inspired décor, how about this tennis racquet patent print? I just love this piece, it’s so different, stylish and not obvious at all. For the diehard tennis fan, a piece like this is a must. Perfect displayed on its own or as part of a larger wall display, maybe even with the upcycled vintage tennis racquets we mentioned earlier. Whether you love a vintage or more contemporary home interior, I think you’ll agree it’s possible to add some tennis inspired pieces to any home décor. Do you have a favourite? Wimbledon is now in full swing which means that summer has officially arrived. The weather doesn’t seem to have realised that yet but a BBQ isn’t a BBQ here in the UK unless you have to stop to take cover from a heavy rain shower, we had to do exactly that last weekend. It didn’t stop us having a good time though, I think sometimes you just have to get on with your plans and ignore the weather forecast otherwise the summer will be over before you’ve had a chance to enjoy it. If you are planning any Wimbledon themed parties or BBQs then I have a couple of handmade garland ideas you might like. The first is made up of tennis rackets and the second is made up of strawberries. You start by cutting a tennis racket shape out of the cardboard and then cutting a circle out of the racket area. Next use the glue gun to stick on some lengths of yarn across the centre. Cut a hole out of the felt in the same place as it is on the cardboard tennis racket and glue it on top then cut around the outside. Repeat this until you have the amount you need then glue some yarn on to the backside of them all to turn it into a garland. Start by cutting a strawberry shape out of the red felt and then the strawberry top out of the green felt. Stitch them both together before using the needle to weave a long piece of thread in and out of the backs to join them all together. They are both really simple to make and look great hanging up on the wall. Also known as The Championships, Wimbledon is arguably the most prestigious tennis event in the world and has been held in the London suburb of Wimbledon since 1877. Unlike most professional tennis competitions, it is held on grass courts. This year the two-week event starts on the 27th June and is one of the only sporting tournaments to enforce a strict dress code on players. In the past, convention had dictated that white was the order of the fortnight and it was strictly enforced, however there are some hints of colour (notably in stripes) creeping back into the kits. When former champion Rafael Nadal first played the competition in 2005 he was famous for tight fitting colourful tops, but Wimbledon regulators suggested that he switch to white equivalents instead. Players’ clothing designs have to be submitted months in advance to get officials’ approval. Although there are no hard-and-fast rules for spectators (they need not wear all white) it is generally acknowledged that Wimbledon is an ‘occasion’ and should be treated like such and so smarter dress is worn. This said, it is the beginning of summer and so one can see a lot of loose-fitting materials, cottons and linen being sported in the stands. For first-timers, it is important to know that you cannot leave or take your seats whilst a game is in play (a game consists of anything from five to seven). Wardens control the spectator entrances and exits and sometimes you can wait anything up to fifteen minutes before the game is completed. Briton Andy Murray will once again be competing however I would suggest that spectators do not make a song and dance about any British sporting prowess or success that Mr Murray may have: flag waving and nice cheering (not during actual play, mind you) is preferred – there’s no need to go overboard. If Murray does not do as well as hoped, one should remember to be gracious in defeat (even though it was not you who were actually competing): congratulate the victor and do not sulk churlishly or lash out – advice that could have been heeded by other sporting fans in recent weeks! Panamas for the men and large brimmed sunhats for women are a good idea, as indeed a good pair of sunglasses. That said, I suggest also bringing an umbrella. Although cumbersome, is always a smart move as it wouldn’t be Wimbledon without a bit of rain. June marks the start of a special time of year for Christy. The sun is making a guest appearance, the BBQs are in abundance and the flowers are blooming, but most importantly, Wimbledon is back. To celebrate the occasion, Christy is hosting a #MyWimbledon takeover, where for the next four weeks, our blog will become your ultimate resource for all things Wimbledon. Over the next month, we’ve got some exciting things lined up for the Christy blog, including exclusive advice from etiquette expert, William Hanson, exciting craft projects to try at home and a look back into Wimbledon’s ever changing fashions over the decades. So, sit tight, stock up on the strawberries and champagne and prepare to indulge yourself in the world of Wimbledon over the next four weeks with Christy. And if you can’t wait to get in the Wimbledon spirit, take a look at the guide we produced for last year’s tournament which is full to bursting with facts, crafts, recipes and anecdotes about the historic British sporting event. Be sure to keep an eye on our Facebook and Twitter pages to tell us what your favourite part of Wimbledon is and stay up to date with our latest posts.